This year Blake is very excited by Halloween and very keen on throwing a party so I have been trying to come up with some ideas to keep the children entertained. First we shall have a Skeleton Skavenger Hunt. I shall draw or print pictures of skeletons, one for every child coming. I shall then cut them apart into 6 pieces; 2 x arms, 2 x legs, 1 x head and 1 x body. I shall hide each body part in a different place. The children will then race around trying to find all the parts to make up a skeleton. I shall give a prize for every completed skeleton and an extra special prize for the person who finishes first. Pass the parcel always goes down well and I have heard about pass the pumpkin for a Halloween version of the game. Basically instead of unwrapping the parcel each time the music stops the child will reach into the pumpkin and pull out a prize. I'm going to make a pumpkin piñata but I'm cheating slightly. I'm using a pumpkin paper lantern and after filling it with treats I shall tape some crêpe paper over the top and bottom to seal in the contents. I'm undecided as to what Halloween version of pin the tail on the donkey I shall make as there is so many options. My two favourites are pin the broom on the witch and pin the heart on the skeleton. Obviously we'll have apple bobbing, a halloween classic and we shall also do a lucky dip in some gooey jelly. Now I just need to select my prizes and treats. The supermarkets are filled with monster sweets and chocolates at this time of year so that will help bulk out the piñata. The toys will have course all be Toyday's. 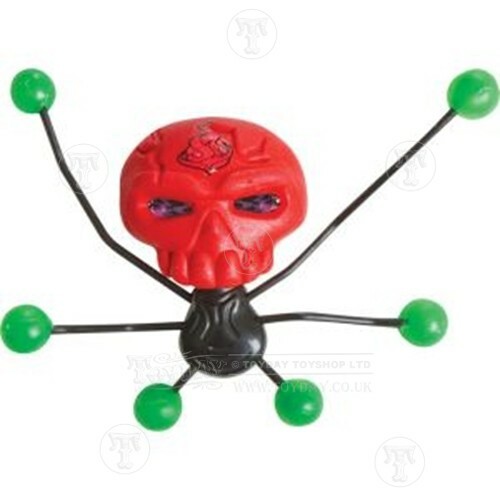 We have stretchimals, jumping monsters, plastic insects, finger frights, snakes, bats, mice and spiders. For the bigger prizes I shall use a monster biff bat and a creepeez wall crawler (as pictured). If you need any Halloween supplies, it's not to late, we have next day delivery for £6.95 so that you can guarantee you spooky toys will arrive in time!